Here’s the thing about Central Oregon – when oncoming cars pass each other, the drivers wave to you. 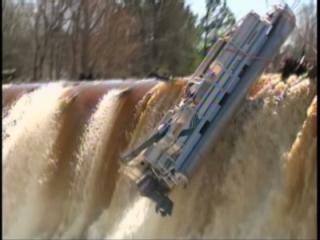 The last time I had to go through an ordeal like that was the last time I was in a pontoon boat. I could stop right here and you could probably come up with the rest of my story for me. I should also explain that my name is Matt, and I work with Jen. As I prepared for my mammoth drive from Portland through Condon and Fossil to John Day, and back to Portland through Monument and Long Creek, it was suggested to me that I log my eating habits (somewhat). I says to myself I says, “What a quaint idea”, and I laughed it off. But after 5 hours of driving the “Journey Through Time Scenic Byway”, every opportunity to stop seemed blog-worthy. My mind was spinning; Andrew W.K. sounded like a great idea to play with the windows down. 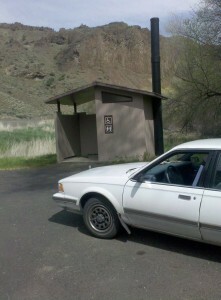 Suddenly I was taking pictures of landscapes, outhouses, and my car next to outhouses. But I digress. This is about food, and I ate food in John Day. Upon stretching and settling in at the Best Western, I did find myself yearning for more than beef jerky and spearmint gum, which with a little help from lunch in Fossil (I found out later that Jen had already blogged about Big Timber Family Restaurant) was all that sustained me through the torment of waving with my hand on the wheel to complete strangers. The smell of sagebrush was in the air. 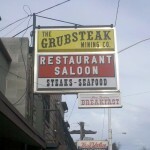 My carefully mapped out venture to Grubsteak Mining Co. was in the cards tonight. 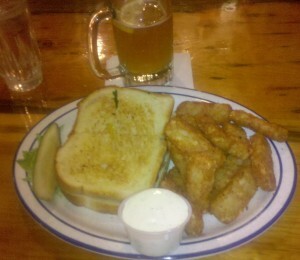 You know when you are hungry and you order something, but as soon as you order it you instantly regret it? Not because you’re worried about how it will taste, but that you know you probably shortened your lifespan and probably the lifespan of your future children? That’s pretty much the menu at Grubsteak. Matty Jr., I’m sorry but that was one hell of a Monte Cristo. And yes, those are gigantic tater tots and ranch dressing. Is there any better mixture of foods? I submit there is not. Needless to say after that feast I took a walk around the neighborhood because it hurt to sit down. Well played, Grubsteak. Well played. Fun fact: I love breakfast, and I had actually planned my breakfast for the next morning before I planned my dinner at Grubsteak Mining Co. The Squeeze-In Restaurant (don’t worry, that’s not the best name I have in store for you) was everything I wanted in a breakfast. 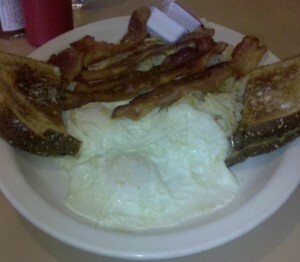 Breakfast is greasy, it’s your choice of meat but you always choose bacon, and it’s a lot of food. One thought: Jen I don’t know how you take pictures of your food without having the locals stare at you. I was such a tourist…not that I blend in anyway. I am at my most content when eating breakfast, and as I mopped up what was left of my over easy eggs with my butter soaked toast I was oblivious to my short sightedness of only staying one night, because that means only one breakfast. Did you know Monument has a food cart? I heard it was the talk of the town, and decided it would be a brilliant idea to meet my AmeriCorps member there. I apologize for not taking a picture of the cart itself – I already felt like a tourist and the lady looked at me quizzically when I said I didn’t want anything on my hot dog. Not wanting to stir up any trouble, I didn’t push the issue by explaining that I was writing for a food blog, as it would seem my story did not match my entree. What can I say? I like my hot dogs naked. It’s the same as ordering a cheeseburger plain, so you can really judge for yourself if this is a tasty burger or if someone in back is smuggling in inferior goods. 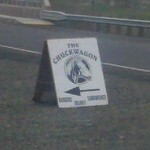 Moral of the story: If you’re ever in Monument for whatever reason, stop by the Chuckwagon.